Luis Valentin, who marched in the Kiwanis Kavaliers in 2003 and the Magic in 2004, submitted this shot. "Here's a picture of me, my girlfriend and two of our friends. We all attend Fort Myers High School (Matt and I graduated in 2004) and all marched at Magic this past summer. This picture was taken by one of our band moms back home who happened to be at the show in San Antonio. 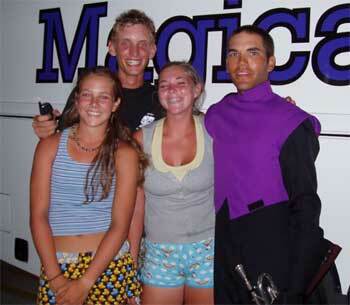 Left to right: Shawna (flag), Matt (drum major), Sam (flag), me (trumpet)." Thanks Luis!